Great harmonica gift idea by Hohner. 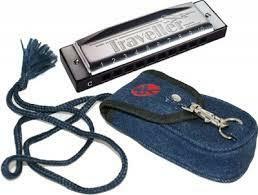 The Hohner Traveller Harmonica. This is for the person on the move. Robustly built to the same specifications as the Silver Star, the Traveller is supplied in a stylish blue denim pouch with a spring fastener, a neck chord, and can also be attached to a belt. Complete with a play in five minutes guide, this makes a great gift, and is ideal as a starter harmonica. Comes in the key of C, perfect for the beginner blues harp player. If you have a travelling buddy a diatonic harmonica just like this can be a great companion and a cool way of making freinds too. Make the sound of the train with this blues harp as you travel. Hooonnnk Hooonnnk!